First Ford Performance unveiled a pair of retro-liveried Ford GT GTLMs for the upcoming 2019 Rolex 24 at Daytona and now it’s followed it up with a set of old school looking Mustang GT4 entries for the race weekend as well. The Ford GTs will race in the Rolex 24 endurance race on Saturday and Sunday, however the Mustang GT4s will race in the four-hour Michelin Pilot Challenge race this Friday. 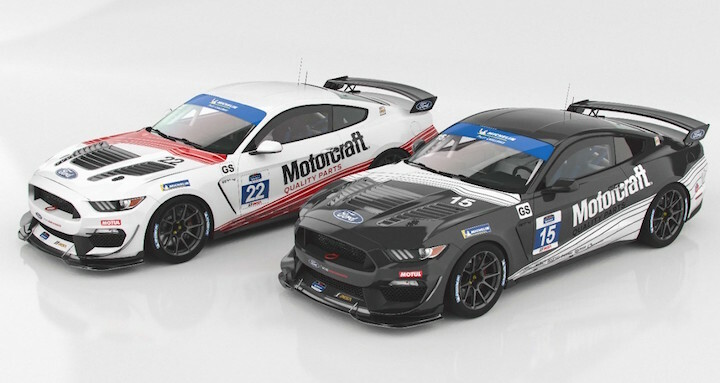 Both races are sanctioned by IMSA, which is celebrating its 50h anniversary in 2019 – hence the throwback look for the Ford entries. Other automakers have also introduced retro liveries for the Daytona weekend including Porsche, Mercedes-Benz, Nissan, Audi and more. No. 22 Mustang GT4 at pre-season testing. The retro Mustangs feature contrasting Motorcraft liveries, which is Ford’s long standing aftermarket parts and service division. Motorcraft branding was sometimes found on Ford racecars in the 1980s, most notably the 1985 Ford Mustang IMSA GTO. Motorcraft sponsorship has also appeared on the iconic Wood Brothers NASCAR Cup Series Ford over the years. Driving the two Mustang entries will be rising NASCAR starts Chase Briscoe, Austin Cindric, Ty Majeski and Cole Custer, who are entered as part of Ford’s Driver Development program. Majeski and Custer will share the black No. 15 car with Canadian racing ace Scott Maxwell, while Cindric and Briscoe will be in the white No. 22 car with Ford hotshoe Billy Johnson. 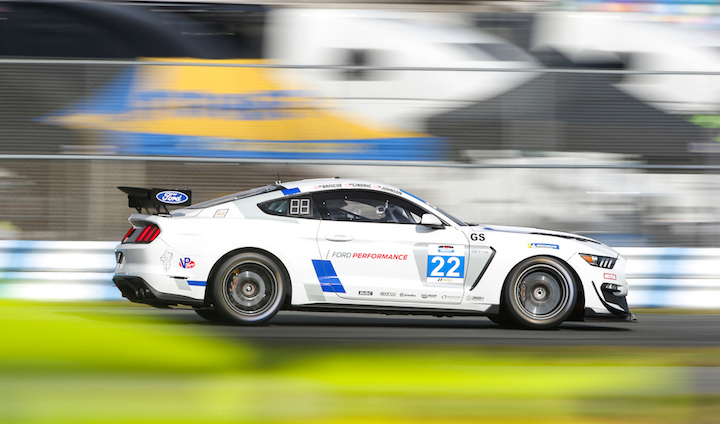 “Running in the IMSA races has proven to be beneficial to (the NASCAR drivers) as race car drivers, and the strong, personal bond that is formed between them has been what we hoped it would be,” said Ford motorsports boss Mark Rushbrook. The 4 hour BMW Endurance Challenge at Daytona is scheduled for Friday, January 25th at 12:05 p.m. ET. A live stream will hosted on IMSA.tv for viewers in certain geographical regions, with NBSCN airing the race in the US on February 6th at 1:00 p.m. ET. Andy Blackmore Design’s full IMSA Spotter’s Guide is also available to download now (click here), which will help you keep track of all the different GT4 cars and drivers.